I had planned to write a blog today about ruins. Roman ruins, to be exact. 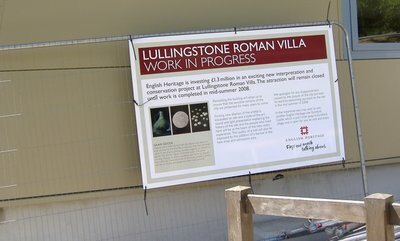 I had stumbled across some in central London a few weeks ago, and after some research found out about a rather well preserved Roman villa just 45 minutes by train to the South-east of London. For reasons I can't quite explain, the concept of the Roman ruins fascinated me. I was going to chalk it up to them being so old, but then Stonehenge is older and I didn't find it that interesting. I wasn't sure what it was the grabbed my attention about Roman ruins, but either way I decided I was going to see them and write about them here. I had pictures of Roman sights in London (the wall, the Temple of Mithras), had done some research into the period of Roman control of the Britain and was ready to put together an entry jam packed with interesting pictures and descriptions of the villa placed within the context of historical fact. This blog entry, however, is not about Roman ruins. This blog entry is about things going wrong. The day started off okay. It was supposed to rain (which would have been fine because the villa is covered) but turned out to be sunny instead. I was starting to think that perhaps I am the reincarnation of Ra, the sun god. How else could I explain the fact that I had been in London for one month and only seen a day of rain. I got dressed, brought along an umbrella and rain coat just in case and headed down to Victoria station. 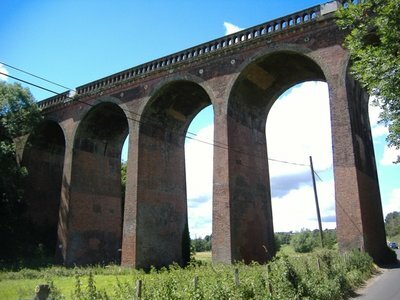 Trains to Eynsford, where the Lullingstone Roman Villa is located run from both Blackfriars station and Victoria station. 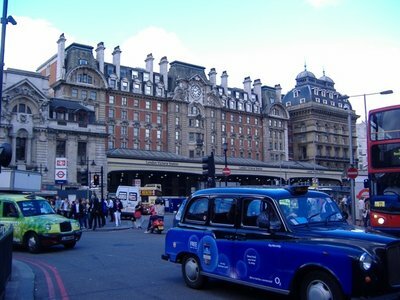 The train from Blackfriars is direct, but the train from Victoria is quicker, even though it requires a change, so I decided to go with Victoria station. That's when the trouble began. I had a piece of paper on which I had copied down the name of the town I was going to, "ENYSFORD." I went to the automated ticket machine, and there was no Enysford as a destination. I went and looked at the route map and it didn't list an Enysford station either. I contemplated getting into the line up for tickets which was very long and very slow. I was very confused. Had the website lied to me last night? 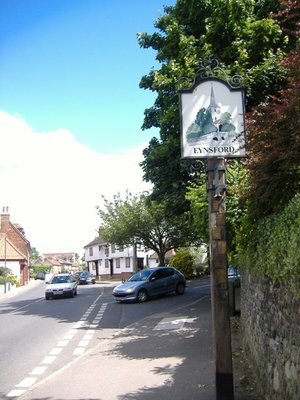 Did trains not leave from here for Enysford? Finally I found a different route map that showed a more central view of London and the surrounding area. Apparently the route map I had been looking at only showed major stations. I found the place I was going on the very edge of that map. Did you catch it, what I had done? 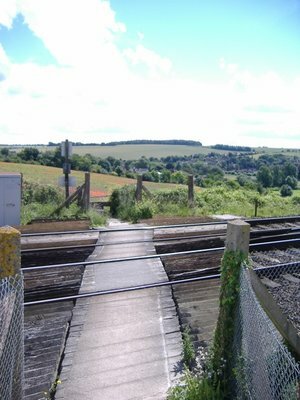 Look back three paragraphs, where I said, "Trains to Eynsford, where the Lullingstone Roman Villa..." and compare that with the station I was looking for in the preceding two paragraphs, "Enysford." Apparently I had suffered a temporary case of dyslexia when coping down the name. "Well, no harm, just a few minutes wasted," I said as I purchased my ticket and grabbed a timetable so I would know when trains were returning to London. I thought it would be the last gaff of the day, but it was only the first. Next up, figuring out where to go. Ticket in hand, I stood staring up at the board. 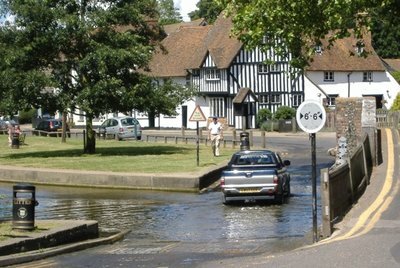 Eynsford wasn't listed anywhere on the board. I went back to look at the route map, trying to figure out what the terminal destination would be, but it was hard to do as the lines criss-cross each other all across the map. I wandered around aimlessly for another 10 minutes, staring up at the board listing departures, feeling like a complete moron. "Damn man, you can't even figure out how to take a train?" I scolded myself. Finally I clued in. All the trains listed on the board were departures on Southern railways. I looked at my timetable. South-Eastern Rail. Sighing, I headed to another part of the station that listed South-Eastern departures on the board. ...the train pulled into Eynsford station. Next up, a short stroll to the Roman Villa. I had checked out the location of both the train station and the villa using Google maps last night, and I knew that you left the train station, when down Station Road to the main road, turned left and then a little ways along there was a footpath on the right side. No worries, no problems. The station had a map of the local area, so I thought I would confirm my directions. I looked at the map, got completely confused by what I saw, and determined that I should turn right instead of left at the end of Station road. My confusion was further enhanced by the sign at the end of station road saying that the villa was to the right. So I turned right, which was wrong. I knew it was wrong almost immediately as there were way too many houses along the side of the road and the villa was out alone in the country, but kept going anyway. 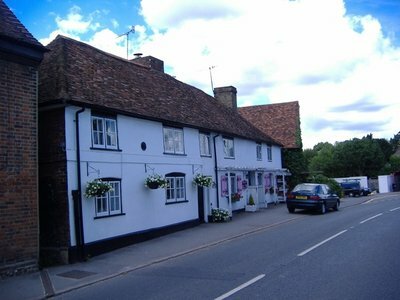 Soon I found myself in central Eynsford. It was very picturesque, but I had come to see a Roman villa, not a picturesque country village. I took some snaps anyway. I consulted a map I found nearby of footpaths in the area. "Aha, I may have taken a wrong turn, but all is not lost. If I follow this road I'll hit the Roman villa in no time," I said. So, of course, I didn't follow the road. Actually, I followed the road for about 200 metres. Then there was a footpath off to the right. "Well, it looks like it vaguely follows the same path as the road, and is probably more scenic," I thought. So I took the footpath. It was very scenic. 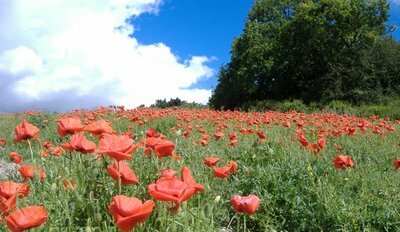 First I walked through these red flowers. It made me sleepy, so I lay down. When I woke back up, my companions the scarecrow, lion, tin-man and that little girl from Kansas were gone, but no worries, they were headed somewhere different anyway. I carried on over a pedestrian crossing on the rail tracks, which amazed me. Trains are electric here, and get their power from a third-rail on the ground. The third rail is discontinued at the footpath crossing, but two a few feet on either side is a high voltage electric rail. I can't even imagine this in North America. Somebody would wander over to their right, get electrocuted and sue the pants off the rail company. Europe is a different animal than North America, with their off piste skiing and high voltage footpaths. At this point I noticed that the path had diverged quite dramatically from the road. If the road was heading east, I was heading north-east. I considered my options - onwards and hope to find a path back down to the road, or turn around and backtrack. The sensible thing would have been to backtrack, but I carried on. I walked for another 20 minutes, by which time I was sure that not only was I far from the road, but I would have passed the Roman Villa. Finally I found a path heading towards the road, so I took it. The path was very overgrown and closed in around me. Leaves and branches brushed against my arms as I walked, which wouldn't have been a problem if it wasn't for the fact that some of the plants had thorns. A thorn managed to dig it's way into my left hand, stinging ferociously and causing a pool of blood to cover the top of my hand. I finally emerged on the road. I was sure that the Roman Villa was to my left, so I went right. 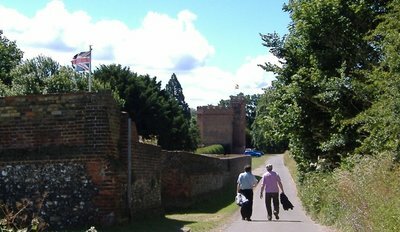 I went right with reason, though, as there was a sign that said that the Lullingstone Castle was to my right. 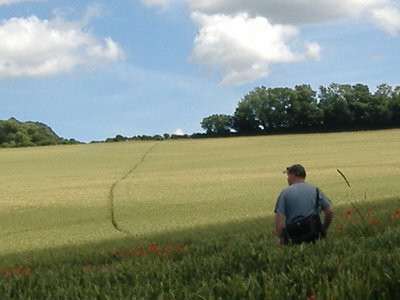 I figured I would go and see the Lullingstone Castle, and then double back to the ruin. I wandered down the road, a nice, winding country road with little traffic and scenic farms and fields off to either side. Perfect for a walk, and these two gentlemen would agree. 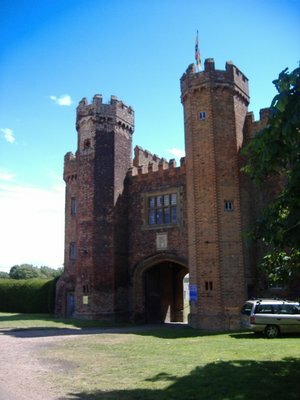 Now, as I hadn't planned on seeing the Lullingstone Castle, I hadn't done much research on it other than to know that it existed. I had browsed the website and knew the basics. 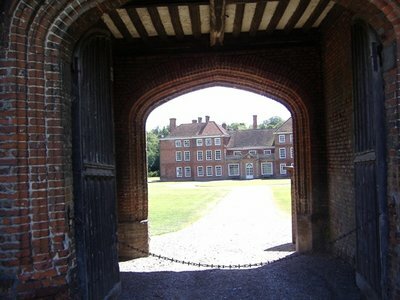 Lullingstone Castle is a family estate built in 1497. Its present owner is Tom Hart Dyke, who is a plant hunter. He was once taken hostage by FARC guerillas while searching for rare orchids in the Darrien Gap between Panama and Columbia. While as the FARC's prisoner, he decided that if he got home he was going to plant a "World Garden," that would "contain plants from around the globe planted in their respective continents of origin." And so he did, and he opens the estate and garden up to visitors. Only, he doesn't open it up every day. That was the part that I failed to notice when I had browsed the website. The site isn't open to visitors during the week, only on weekends. So the best I could do was take a few photos of the gate and turn around and head back towards the Villa. I had fumbled getting my train ticket. I had turned the wrong direction. I had taken a footpath to nowhere. I had gotten lost. I had seen a castle that wasn't open to the public. All that didn't matter, though, because I had only come to see one thing. I turned a corner and saw the large aluminium building which covers the ruins of the villa to protect them from the elements. I developed a spring in my step as I approached the front door. I turned the corner and saw perimeter fencing blocking the entrance. "What the heck?" I said, walking closer. Workmen walked in and out of the building, covered with dust and dirt. A large sign was posted on one of the fence panels. Closed, until mid-summer 2008, whenever that is. All that trouble, all the things that had gone wrong, they all caught up with me. My day turned dark. "Damnit," I said to no-one, though a few of the workers turned and looked at me, "you think that's the kind of thing that English Heritage would have mentioned on their website." The workers shrugged and walked away, exuding an air of indifference. I was left to stew in my own juices. I walked back dejectedly to Eynsford, where I took the advice of the closed sign and saw Eynsford Castle. Unlike Lullingstone Castle or Lullingstone Roman Villa, it was open and free. Also unlike Lullingstone Castle, this castle is a ruin. It dates back to around 1100 and was used by the Normans until it was abandoned in 14th century. It saw some use later as a stables (which included knocking some holes in the walls to bring hay in and out), but now the horses have moved out and it's a dedicate tourist site. 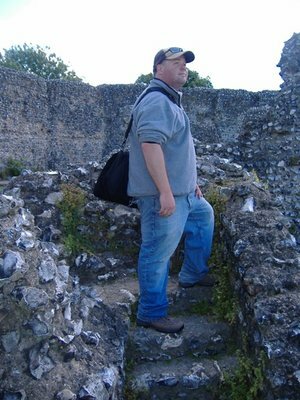 At the time I figured this was going to be my only adventure of the day, so I put on a brave face and took this shot, with me trying to look like a majestic explorer. Inside though, I was pretty bummed. 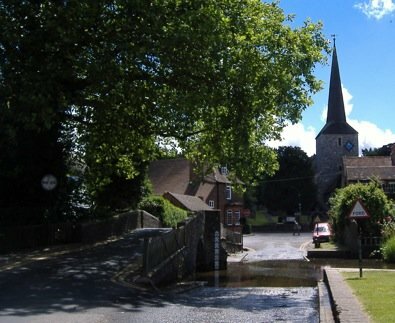 Eynsford is not a big place, and so other than the 3 attractions I had come and seen, there is little else for a tourist to do. 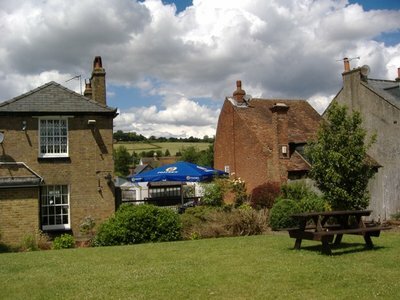 I went across the street from the castle to the Five Bells pub and had some lunch, contemplating what to do next. I perused my train timetable. Trains back to London left every 30 minutes at 17 and 47 past the hour. I could be back in London by 3 o'clock. I couldn't let myself do that, though. I gave myself a pep talk. "No, come on, Wesson. Don't let this day defeat you. If nothing else, you've come all the way out to the country side. Why not take a look around. Surely there must be something worth seeing." So I headed out, off the main road, up past a park and into a large field. 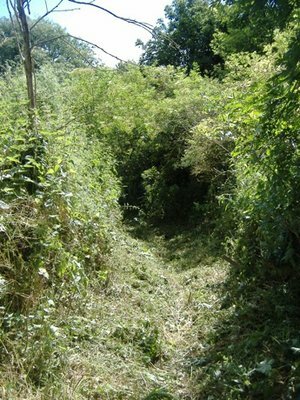 Here in England there are public footpaths that criss-cross the country, many of them cutting right through private land. This was one of those paths, cutting through a field of green wheat off into the distance. It immediately reminded me of the movie trailer for Toys, the 1992 comedy staring Robin Williams, where he walks through a field of green grass, just like this one. I didn't know where the path led, and debated turning around and heading back to the train station instead of taking a path that might get me lost in the middle of the English countryside, but I carried on. I reasoned that going home would be tantamount to admitting defeat, and I already spent one day last week sitting at home looking up sad clips from films on YouTube and crying. I wasn't going to let that happen again. So I followed the path. 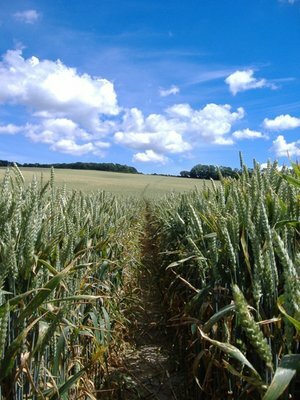 I walked through the field, letting my hands brush the wheat. It reminded me of another movie. This time Gladiator, which uses the image of walking through grass to symbolize Gladiator moving into the afterlife. I laughed. "I don't want to go into the after life today," I said. At the top of the hill the path cut through a stand of trees and into another farmer's field. There the path rose a bit more before cresting a hill and providing an amazing view of rolling hills of green off into the distance. "Green fields," I said to myself. A memory was triggered at that moment. 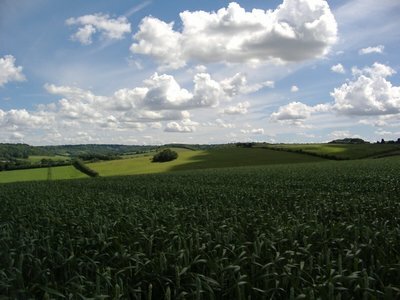 The term greenfield is used in IT to signify a project that is going to be built from scratch. It signifies that you have a blank sheet of paper with which to start, and you can design the project anyway that makes sense. You don't have to worry about any old bits of technology, wonky bits of old code, out of date software modules or licensing agreements shackling you to a specific solution. You can do anything. It's a fresh start. "Yeah, that's what this is. It's a fresh start. Forget about earlier. We start right here, right now," I said, and started to laugh. When I said that it was a fresh start, I had consciously only been thinking about that day, about putting the mess up at the train station, the wrong turns and closed villa behind me. But then I realized that I wasn't just talking about that day. I was talking about everything. I worked on one massive greenfield project once, building a call centre with 300 agents from nothing. We started with 3 floors of an empty building, nothing but concrete floors and elevator shafts, and built it into a show piece of technology and people. It was one of the toughest things I have done. We were installing servers on one side of the floor while workmen were putting up walls on the other side. I spent a lot of late nights and 16 hour days dealing with schedule delays, software installations going wrong, power outages, failed integration tests and a million other problems. In the end, though, it was an amazing feeling to see it finished. I took a lot of pride in the work I did there, that I was part of the team that built that place up from the greenfield of those concrete floors. It hit me in that field that was what I was doing here in London. A fresh start on my life. It was greenfield. I came over to the UK with two bags of clothes and an Apple MacBook, and that was it. Everything else was left behind. I have a blank sheet of paper to design my life on. I don't know how long it will take, maybe months, maybe half a year, maybe years, but at some point I will "settle" in here, and I can take pride in the fact I did it all from scratch. More importantly though, I now had an image. An image I can use to pick me up in the interim when things were going wrong. All the days that want to bring me down, the tortuously slow interview processes, the confusing adminstrivia of trying to get bank accounts, health coverage and taxes set up, getting lost on the streets of the city I am supposedly a resident of. For all the times when I want to go home and watch Wilson float away on the sea and cry, instead I can now think of green fields, and remind myself that it may be slow and hard and painful at times, but that I am building something from a blank sheet of paper here and eventually my new life will get built up into something special. From nothing more than a greenfield. Nice bit of writing here, especially part 2. Not often you read an IT term turned into a new start in life!